Chaos is wind. In Greek mythology, chaos was the origin of all things. Chaos was the primordial void. Arguably, chaos is the primordial void. Χάος spells the word in Greek. In the 17th century, a Dutch chemist, Jan Baptist von Helmont, equated chaos with gas. He based his decision on work done by Swiss alchemist and mystic, Paracelsus. The 'g' in 'gas' comes from the Dutch pronunciation of that letter, a spirant, also used to pronounce the Greek 'X'. Chaos is gas: A state of matter that has neither independent shape nor volume but tends to expand indefinitely. Now, of course, we have turned this substance to good use. Gas heats and cooks and powers the automobile. It powers the intestines, large and small. Indeed, wordsmiths might be well personified by Wind. Order and chaos go together like a kiss and a smile. Ordo ab chao: Out of chaos, comes order. This Latin phrase is one of the oldest mottos of Craft Freemasonry. Take a good mason and make him better was the goal of this ancient fraternal organization. In the arts, aesthetics provide a set of principles whose goal, in a broad sense, is to find order in the void and represent what was found. In a narrow sense, this becomes the exploration of beauty; but the topic continues to expand. A four volume encyclopedia dealing with all the varied aspects of aesthetics awaits your inspection. To say that the aesthetic is the antonym to chaos does not overstate the case. unfinished, unsigned, but as contentious as a rabid dog has elicited nothing but controversy from art critics, blowing hard. To me, the message is clear: the perfect circles in the back ground say, Yes, Aristotelian ideals are all well and good (beyond 'order', some 'perfection'); but, look at me, this is the reality (Chaos ordered). Sure, I could paint like you fellows if I chose to; but I don't. Deal with it. 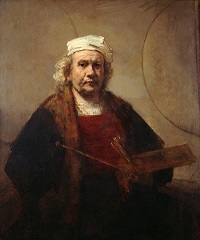 And no more harmonious arrays exist than those of Rembrandt. The motif of this struggle against chaos (chaoskampf in German) is ubiquitous in myth and legend, and equally so in modern literature, music, painting, and other arts. We live in the maelstrom., the whirling void. And from that void, we create our own world, colorful or drab or gray or gay or bleak. Day by day. Moment by moment. Harnessing the wind. 2 From 1665-1669, oil on canvas, 45" x 37"; Kernwood House, London.